W along ties and body = 1385 mm, L = 170 mm, Iron beads diam = 6.5, th = 3 to 10 mm; red glass bead diam = 2.5 mm, white glass bead diam = 3 mm; diam cord = 4 mm; W ties = 11.5, th ties = 2.2. mm [RTS 23/8/2004]. Apron worn by married women. The body of the apron is made up from 49 cords, each composed of 6-7 hide strands twisted together. 1 of these cords appears to be half the length of the others and stitched in place to the top band at the edge of the apron. The remaining 48 cords have each been bent double at the top, and secured by binding a hide strand several times around their upper body. Each of these bound sections has then been fastened to its neighbour by horizontal rows of stitching - with a single row of stitching visible on the back, and a double row visible from the front. This has created a band, 17 mm long, that runs across the top of the fringe. There is an additional twisted hide cord with two ends hanging loose on one side of this band, and one shorter cord hanging from the other side; both have knotted ends. Below this band, the lower parts of the cords hang freely as a thick fringe, around 150 mm deep. The lower part of each cord has been weighted down with a series of metal beads, secured at the base with a knot in the cord. These are predominantly made from narrow strips of iron, hammered into loops with the ends touching and then polished to give a shiny metallic gray surface (Pantone 877C). These vary slightly in form, ranging from disc beads to long cylindrical beads. Interspersed among the iron beads are 44 brass beads of similar form and made using similar techniques (Pantone 871C). Most, but not all of these have been placed at the ends of their cords as single beads or in pairs. There are also two small opaque glass beads sewn onto the end of one cord, one a short cylindrical bead that is red (Pantone 201C) with an opaque white core, the other white and ring-shaped. The apron is fastened around the waist using two narrow brown rectangular hide strips (Pantone 4625C) that have been pierced at the ends and sewn onto the edges of the waist band. One of these has a lentoid-shaped slot cut into it midway along its length. The other tie would have been passed through this slot and pulled tight to hold the apron in place. The apron appears to be complete; the surface of the hide is heavily coated with red ochre, but there are only minimal traces of ochre visible on the beads. It has a width of 1385 mm, running across from one tie to the other, and a length of 170 mm. A typical metal bead has a diameter of 6.5 mm, with thicknesses varying from 3 to 10 mm, while the glass beads have diameters of 3 mm (the white bead) and 2.5 mm (the red bead). The cord fringes measure 4 mm in diameter; the hide ties are 11.5 mm wide and 2.2 mm thick. The object is heavy, weighing approximately 1 kg. This object was collected by Samuel P. Powell, and loaned to the Pitt Rivers Museum in 1940. It is known in Bari as jufferaba. For other types of Bari aprons, see 1940.7.011 ( pilia, worn by very young girls), and 1940.7.010 ( wande, worn by girls). Schweinfurth discusses the role that early iron beads had to play in the Southern Sudan, amongst groups like the Jur Luo: 'iron beads or perforated little cylinders of iron… were earlier in use than glass beads… In the Soudan these string of beads were principally made at Wandala, and Barth has specially noticed them at Marhi. Every tribe which I visited in proceeding inland from the Gazelle I found to retain the preference for beads made of iron (G. Schweinfurth, 1873, In the Heart of Africa Vol. I, 203-4." Metal beads are incorporated into a range of objects as decoration, including Lango strip apron 1925.14.4, and Acholi fringe apron 1940.7.095. Currently on display in the Lower Gallery, Case 42B number 1c. Accession Book Entry [Loans II, p. 308] - ESTATE OF S.P. POWELL, C/O N.H. HASLAM, Esq. Manager, Westminster Bank, Stony Stratford, Bucks. Collected by himself. Data from his labels and notes. From the BARI TRIBE, EQUATORIAL PROVINCE, ANGLO-EGYPTIAN SUDAN. 1940.7.09 - Married woman's sporran, string fringe weighted with metal beads ( jufferaba ). Card Catalogue Entry - There is no further information on the catalogue card [RTS 10/2/2004]. Related Documents File - Appears on undated typed list: "Bari Collection from the Equatorial Province, Sudan. Three different types of sporrans: - (a) The Jufferaba, which is worn by married women. 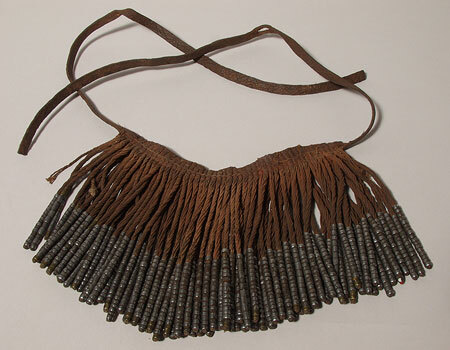 This has a string fringe twisted to cord thickness and weighted with metal and brass beads or rings". List is annotated by hand on back: "List of Curios" and "Far from complete" [RTS 16/12/2003]. Old Pitt Rivers Museum label - SUDAN, EQUATORIAL PROV. BARI. Married woman's sporran (jufferaba), S. P. Powell coll. Lent by his Executors. 1940.7.09. [JC 28/2/2002; tied to object]. Sparks, Rachael. "Bari fringe apron" Southern Sudan Project (in development). 03 Jan. 2006. Pitt Rivers Museum. <http://southernsudan.prm.ox.ac.uk/details/1940.7.09/>.